Most of my Goodreads Giveaways are drawing to a close at the end of this month, so I wanted to do one last post to remind you to enter the drawings if you haven't already done so--and tell a friend. I'm giving away 3 to 5 PRINT copies of each book! Tea for Two is the charming love story between Viscount Brendan Wyndham and Shannah, a house maid in his employ. Surely Brendan is too wise to be caught by Shannah's soulful eyes or lovely face, but his heart tells him there is far more to this young woman than meets the eye. 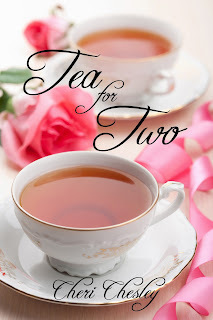 Tea for Two is the first in a series of short stories and novellas that take place in the same fantasy world where I set my Peasant Queen series--the world of Eeryan. This story takes place far away from Fayterra and all of the established characters from the series, but it's nice to set it in a world that is already somewhat familiar. Look for more Eeryan world tales in the coming years--tales of pirates, princesses, servants, runaways, and all manner of exciting people! Along that same line, The Lost Princess is the final installment in my Peasant Queen series, and ties up the remaining details of the people of the kingdom of Fayterra. It picks up mere weeks after The Tyrant King ends, and introduces Jessenia--King Gregory's long lost sister. How does Jessenia fit into the family? That's a great question, one that she is eager to answer. If you read the companion novel to the series, The Wild Queen, you'll be happy to know that The Lost Princess brings resolution to several of your favorite characters from that story as well. 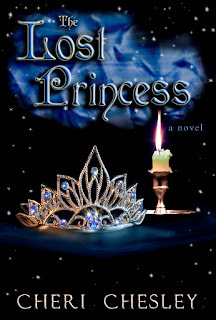 The giveaway is for 5 print copies of The Lost Princess, so your chances are good! Departing from my series work altogether, this is City of Light, my latest fantasy. The giveaway is for 5 print copies, and it's been my most popular giveaway this month. The Demon wants Aisilyn for his bride, and he’s sending his Dark Warrior to get her. Her sister, Gennavieve, isn’t about to let that happen. Five families wait with dread, uncertain if their Aisilyn is the one the Dark Warrior will take. Only Gennavieve remains convinced the Warrior will come for her sister. To protect Aisilyn, and her upcoming marriage, Gennavieve puts herself in her sister’s place—allowing the Dark Warrior to claim her as the Demon’s chosen bride. What Gennavieve never considered is what she would do if she fell in love with the servant of darkness. In a world driven by faith, no one knows which prophecy will be fulfilled—or whether Gennavieve’s choice will lead to the Demon’s destruction or her own. 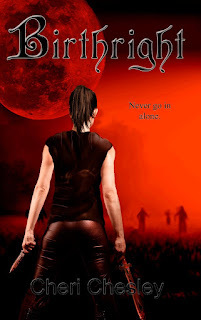 Birthright is the last of my giveaways, and the only one that extends beyond the end of March (so it's the only one you will hear about after the month ends). You've never seen zombies quite like this before. The unwanted daughter of a king who must have sons, Verity fights against her father’s betrayal the only way she can—by fleeing the relative safety of her past and taking her chances in the unknown, untamed wilderness. Verity must learn who she can trust—and who wants her dead. Enter to Win a Copy of Birthright! The final Goodreads Giveaway is here: Birthright! I can hear you wondering why start a giveaway on the Thursday? This giveaway runs from March 17 to April 22. That may sound a bit odd, but both days have a deep significance to me, and I wanted to commemorate them. March 17 is my brother's birthday, and April 22 is my dad's (he passed away in 1983). Keeping it in the family. Enter to win one of 5 copies HERE! You may remember that Birthright was up for the Kindle Scout program last year. Here's your shot to see what the fuss was all about. Enter to Win a Print Copy of City of Light! 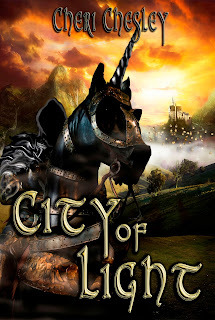 Here's the third of 4 Goodread's giveaways: City of Light! Contest runs from March 1-March 31. It's probably me, but this is one of the most beautiful covers I've ever seen. Not only can you enter for a chance at 5 print copies, but City of Light is also up for a Swoony Award this year! The Swoony's are great, because they highlight clean romantic fiction, and you can vote for up to 100 of your favorite titles (you know, if you're an avid reader like I am). The giveaway can be entered HERE. If you want to check out the Swoony contenders and cast a few votes, you can do that HERE.